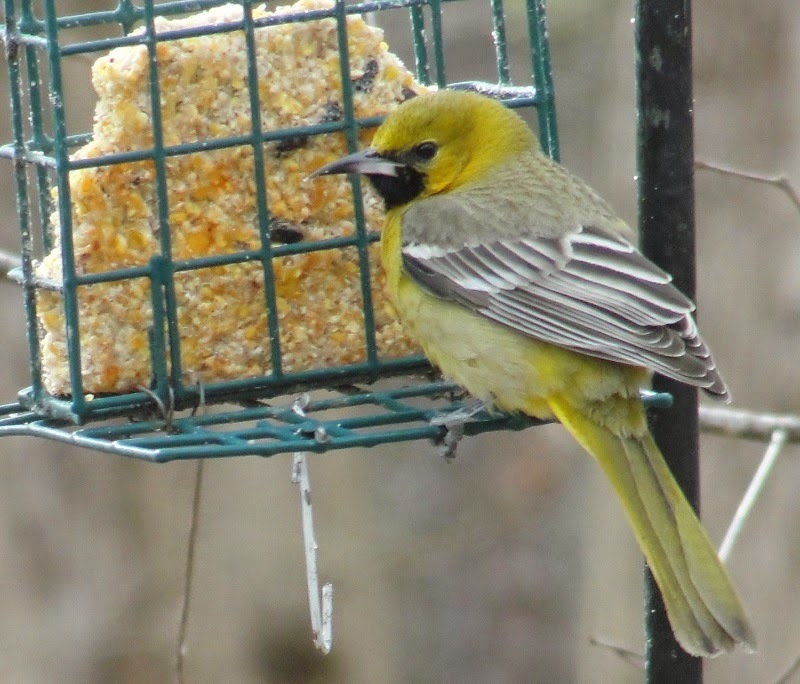 For the second time in two weeks, area birders staked out an odd oriole that has been visiting a feeder near Freedom Park. 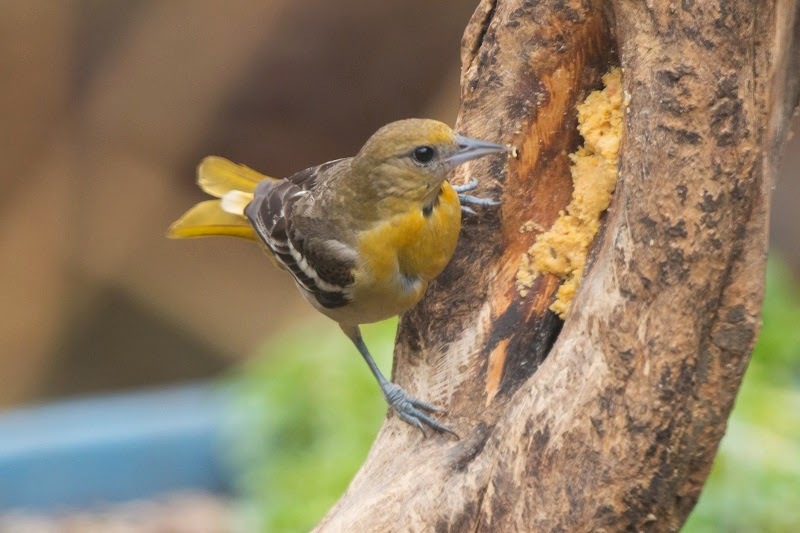 Baltimore oriole reports have spiked in the last couple of weeks and there is always the possibility that a very rare Bullock's oriole could be in the mix. I received photos of a bird that looked like it could a female of that species, so I asked four area birders to check it out. Unlike the unsuccessful wait for the hooded oriole, the target bird was very accommodating this time. Below are some comparison photos of immature Baltimore and Bullock's orioles, and then some photos of the unknown bird. 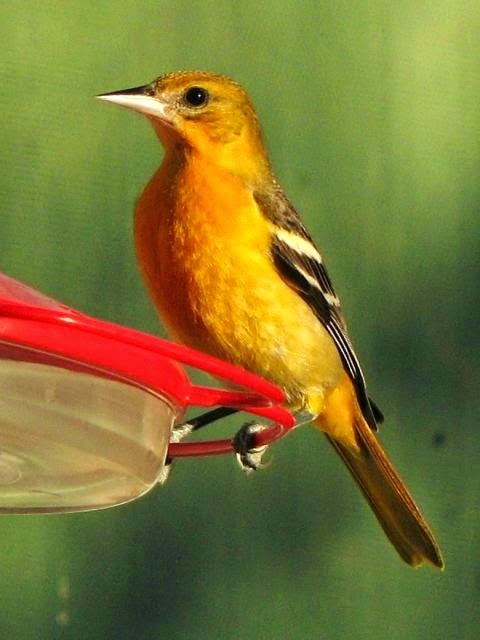 This is a typical female Baltimore oriole. Fairly brightly colored on the whole underside with the brightest color in the center of the breast, as compared to the side of the face. The face is plain, with no suggestion of a line through the eye. 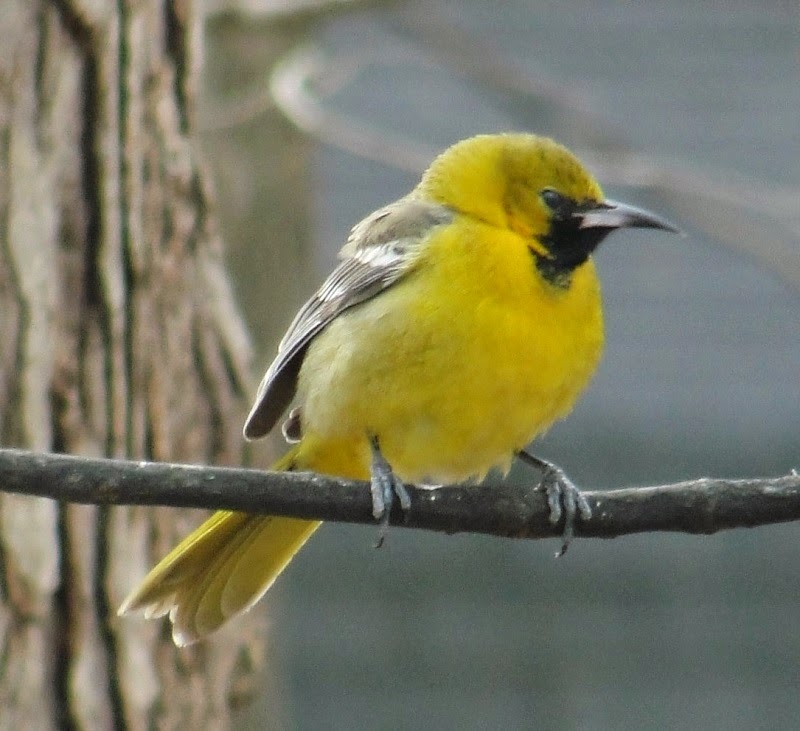 This Bullock's oriole, an immature male, shows the brightest color on the sides of the face when compared to the breast. There is an obvious black line through the eye. Note the belly is pretty plain gray, lacking any orange or yellow plumage. This is the bird everyone went to look for, and here is where the identification of immature orioles can get tricky. There is a wide range of variation in plumage intensity of immature orioles, and there are are naturally duller individuals. On the whole this bird is pretty dull. 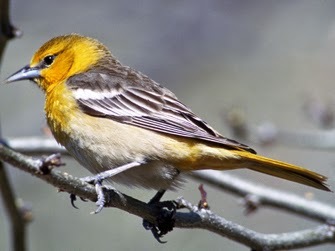 no bright colors and a pretty plain belly, like maybe a Bullock's oriole. There is only one record from Mecklenburg County. This more straight-on view of the same bird shows a bit more color on the breast, certainly the breast is brighter than the face, suggesting Baltimore oriole. An in an interesting study in birder perception, some of the observers said there is an eyeline while others said there was not. Much debate ensued over the true identity of this bird. Everyone hoped it was the rarer Bullock's but no one was 100% convinced either way. The dreaded "H" word was even mentioned; a hybrid between the two species. No one wants that. A hybrid isn't anything but a hybrid. A hybrid can't claim to belong to any species. Eventually most everyone ended up leaning towards the bird being a very dull first-year female Baltimore oriole. But is that correct? Sometimes that's the way birding goes. You can't put a definite name on every bird you encounter. Check those Pine Siskins Carefully. The cold air streaming into our area the last ten days or so was accompanied by a massive irruption of pine siskins into the mountains and piedmont of the Carolinas. 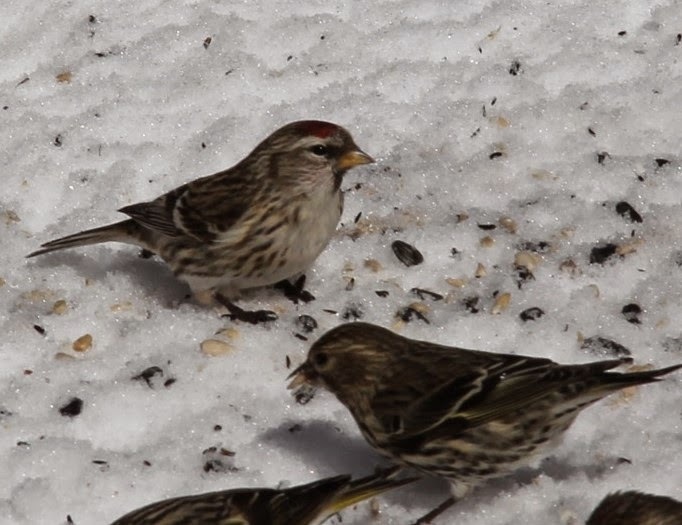 Backyard feeders have been inundated with as many as several hundred birds in some cases. If you have noticed a surge in bird numbers at your feeders you are certainly not alone. A few pine siskins are fun. One hundred birds can put a serious crunch on your bird-feeding budget. They can consume pounds of sunflower seeds each day. I say enjoy them. They are not here every year. It might be some years before they appear again in these numbers. 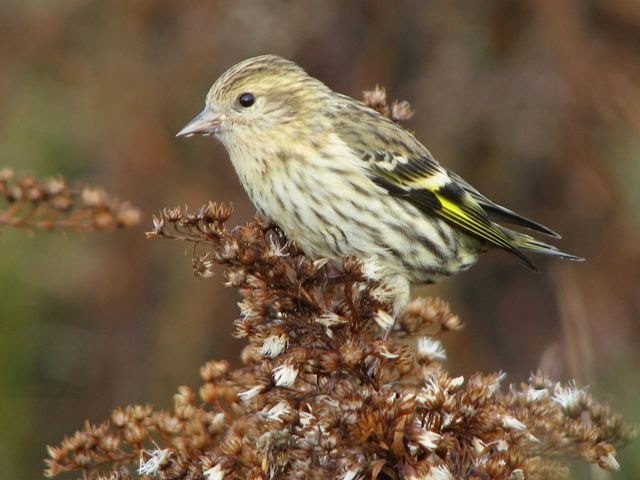 Pine siskins are tiny streaked birds with yellow wing markings that vary in intensity from individual to individual. This bird displays failrly prominent wing bars. And be sure to closely examine your siskin flock. A common redpoll might be among them. Note the yellow bill and the red patch confined to the top of the head. Finding one of these is possible but still a long shot. But they are here. Starting sometime Wednesday evening it looks like the southern Piedmont is in for about 60 hours of sub-freezing temperatures. Local wildlife can generally withstand the cold, but local birds can get stressed when available water is iced over. Water is harder to find than food. Not all birds visit feeders, but all of them require water. Cedar waxwings and American robins seem to absolutely flock to water sources when temperatures are below freezing. By providing water you not only increase the potential to see some new species, but you provide an essential need for their survival. With Thursday's highs predicted to be in the mid-20's it can be a challenge to keep water thawed. There are heated birdbaths on the market, and I hear they work wonderfully. The more ingenious and handy of you can probably come up with a way to heat your own container of water. Whatever, the result is likely to be dramatic for the rest of the week. These cedar waxwings and american robins over ran a back deck a few years ago during a heavy snow. 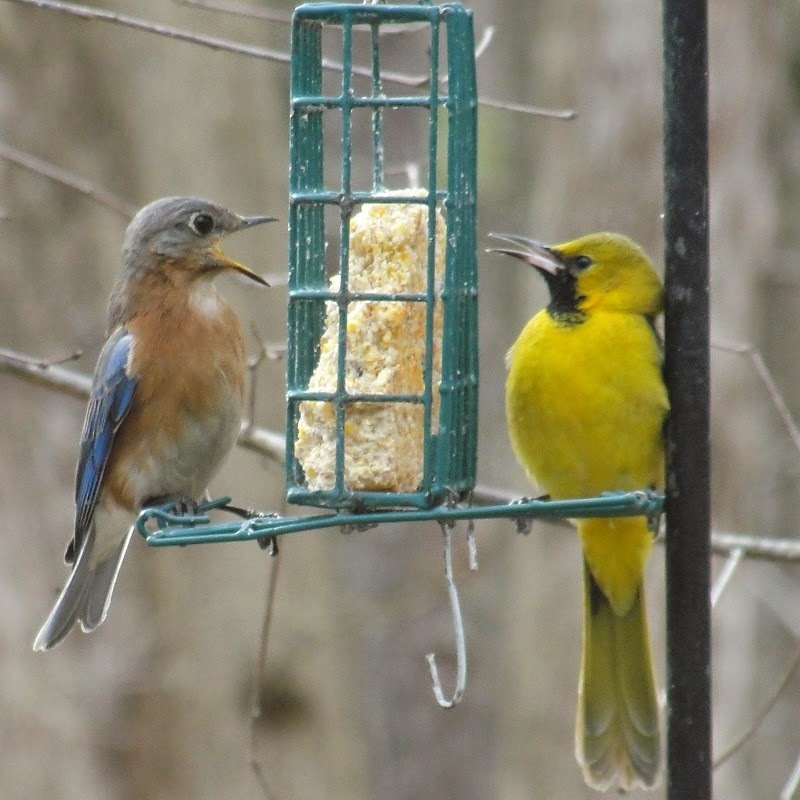 Those species do not normally visit feeders but are among the most frequent visitors during freezing weather. It’s almost Valentine's Day and this evening throughout the shrubby fields, pastures, and cutovers of our area, birds are celebrating the occasion. I am of course talking about the courtship of the American woodcock. These birds are not shy about letting you know what they are up to. The females make the males work too hard to gain their favor for the males to do anything but go all out. The birds don’t seem to mind at all that there might be a crowd of people watching. That is exactly what I and fifteen other birders did last Sunday evening. We gathered at a large clearing to view the spectacular courtship display of the American woodcock. We arrived about five-forty PM at the site and waited patiently for the show to begin in the gathering dusk. Chorus frogs and fox sparrows serenaded us with song. A few red-winged blackbirds and American robins flew over in the fading light. Then, at six-fifteen PM a nasal “peent” sound came from the field edge. Then another, and then another. Three male woodcocks were in the mood and were getting ready for action. The calling lasted a few minutes and then with an audible whistling of wings the birds slowly lifted off and slowly rose high into the air like a spacecraft gaining momentum. At the zenith of their flight, the birds then began singing a high-pitched chirping song as they plunged back to earth in a dizzying, spiraling flight. Once back on the ground they began the calling again followed by the same flight display. Occasionally the females would buzz right by us or just over our heads as they flew into the field to choose the best displaying male. This lasted for about twenty minutes and then it was done. The display period is within a small window of time. The fifteen minute walk back to the vehicles through the woods was quiet and pleasant. The stars were shining bright and temperatures were mild. I really thought some owls would be vocalizing but they decided to keep silent that evening. American woodcock are not rare birds. If you live near some open fields try watching listening for the woodcock display in your area. A big part of finding birds is being in the right place at the right time. When the birds show up, you have to be there. 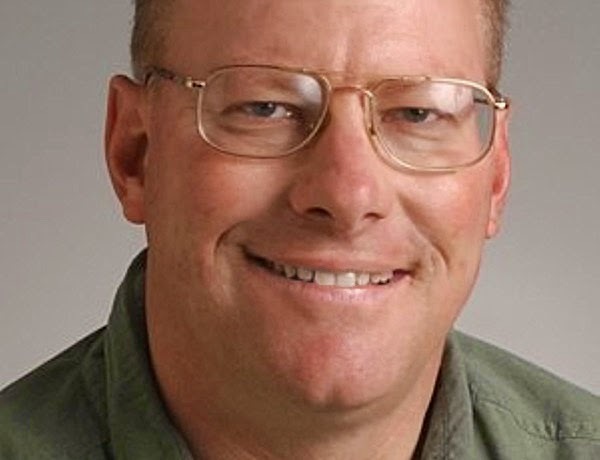 Last Friday, February sixth, local birder John Brammer looked out his window and saw a large yellow bird that he did not recognize. He had the presence of mind to snap off a series of great photos for the next fifteen minutes. Then the bird departed. 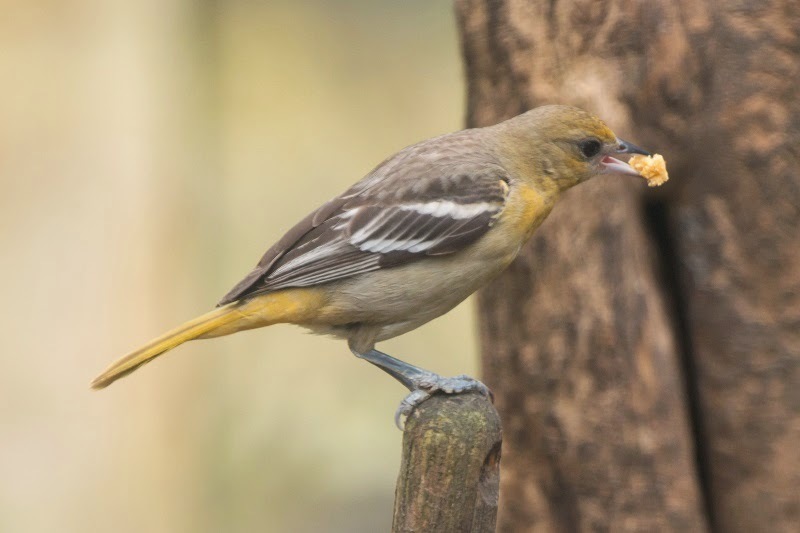 Local birders poured over online photos of immature male orioles (there are not all that many by the way), and identified it as a hooded oriole, a bird native to the southwestern United States and Pacific coast. Though the bird was not seen at all the next day, eight birders gathered at the residence for over five hours on Sunday in hopes of catching even a glimpse of the far-ranging visitor. I set up a folding chair with a clear view of the feeders and for the next three hours and forty-five minutes I watched a brown creeper, hermit thrush, pine siskins, downy woodpeckers, red-bellied woodpeckers, yellow-bellied sapsucker, Eastern bluebirds, red-shouldered hawks, pine warbler, yellow-rumped warblers, an American woodcock fly-by, and more. Over forty species total. But not one of them was a hooded oriole. So this time the birders were at the spot but the bird did not keep the appointment. He probably did not know he was supposed to hang around. Eager to continue his whirlwind tour of the Eastern United States I suppose. Or maybe he is still in the area. I prefer not to think that bird may have been just few houses away the whole time we watched the original site. Birders call birds like these “One-Day Wonders”; extreme rarities that just don’t linger long enough for others to enjoy them. I’m sure there are other rarities at area feeders right now. I am always eager to help with identifications if I can be sent a decent photo. It doesn’t have to be great, just good enough to see some detail on the bird. The hooded oriole is a first state record. Who knows, maybe you will be the next person to make a huge contribution to the bird records of the county or state. When I first saw this photo I figured it to be an immature orchard oriole, a local breeding bird that is supposed to be in the tropics this time of year. Even an orchard oriole would be an outstanding find in winter. But when I saw the bird from this angle, I realized the back color wasn't right and the bill was way to long and thin for an orchard oriole. The size comparison with this Eastern bluebird, as well as the longish tail, also helped local birders ID it as a hooded oriole. Look at the honker of a bill on that bird. I spent last weekend at the Carolina Bird Club’s winter meeting in Nags Head, north Carolina; and I am still recovering! Two consecutive days of multi-mile hikes in soft sand out to Cape Point in Buxton took a physical toll. But it’s a special place way out on the beach in the winter when the only living creatures are the flocks of ducks and seabirds and a small group of birders. Saturday was brutal to say the least. Morning temperatures of 27 F with winds blowing about 25 mph made clothing in five layers essential. But the birds showed up and did not disappoint. 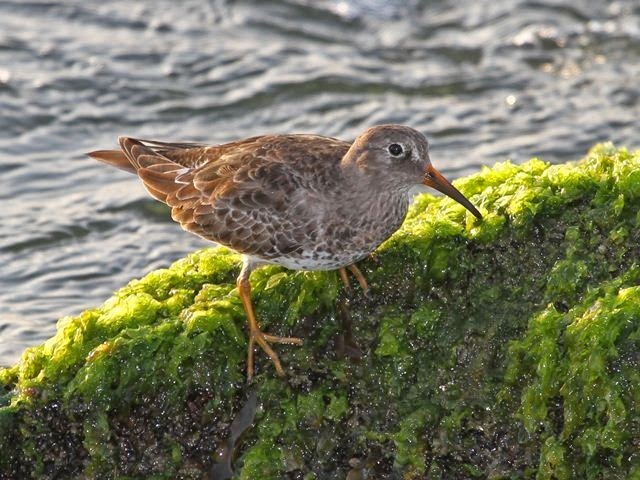 Purple sandpipers are found at only a few locations in NC. Don't look for them on the beach sand though. These birds love rock jetties, bridge abutments, bulkheads, and other hard structure. We found this species at the Oregon Inlet groin. Purple Sandpiper by Jeff Lewis. 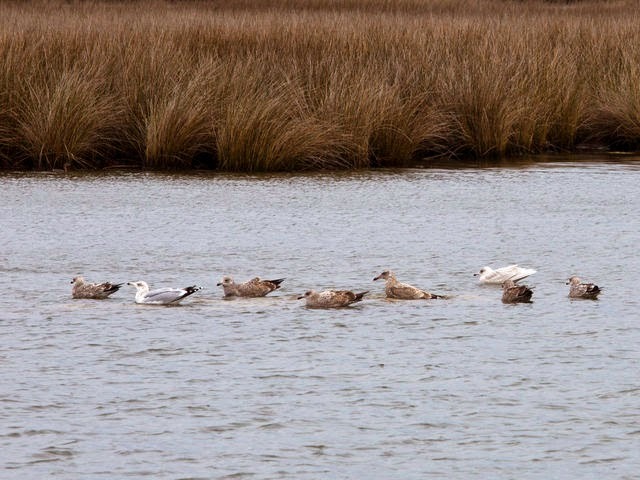 Iceland gulls are much sought-after birds among the winter gull flocks on the Outer Banks. They are scarce but are pretty easy to pick out among their congeners. The Iceland gull is the pale gull on the far right. Note how the wingtips are white in comparison to the other gulls that have dark wingtips. 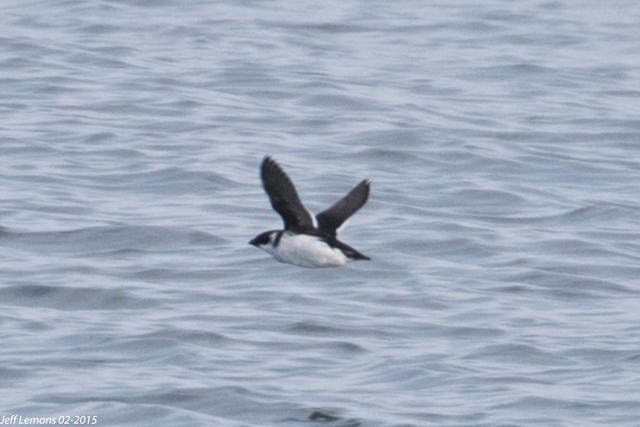 Razorbills staged a major movement just off the beach up and down the Banks. 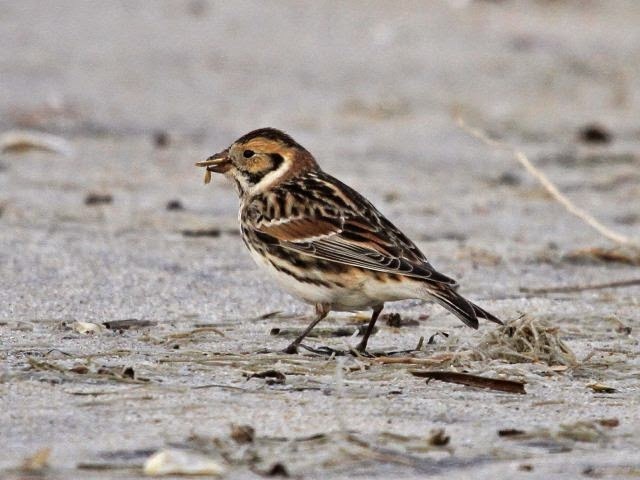 These birds are the northern hemisphere's answer to penguins. The colors are the similar but they are capable of flight, enabling them to nest on steep ocean cliffs far to our north. This is the world's smallest seabird, a dovekie. About the size of a starling, these birds belong to the same family as the razorbill. They also staged a flight along the beach, a pretty rare sight for NC. Not all of the rarities were seabirds. 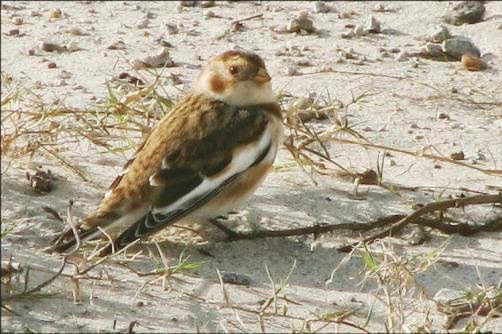 A small flock of snow buntings with one Lapland longspur thrown in have been wintering way out at Cape Point this winter. Both of these species occur on bare ground or sand with no trees or shrubs. Cape Point is perfect.We were lucky enough to see them on one of the treks out there. 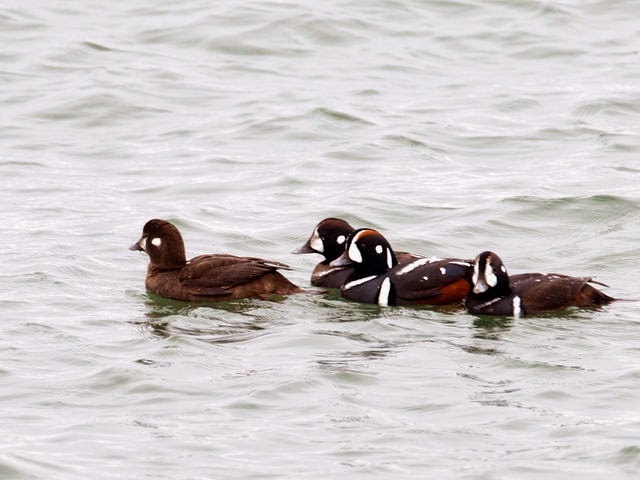 Perhaps the rarest of all was a harlequin duck at the Rodanthe pier for the whole weekend. Our bird was a female or immature male type, similar to the bird on the far left. The males are stunning. I have been seeing a lot of bald eagles lately; from many birds down east at Alligator River National Wildlife Refuge to some birds right here in Mecklenburg County. Bald eagles take up to five years to attain the classic adult plumage that even non-birders readily recognize. But for the first four years of their lives the plumage can be highly variable. Here is a classic adult eagle. All white head, yellow bill, dark body, and white tail. This bird is at least five years old. This photo is of one of the nesting birds from Mecklenburg County with the chick. The parent is on the right. Notice the head is almost completely white except for some dark smudginess behind the eye. This is indicative of a four-year-old bird. Almost certainly this was that bird's first nesting attempt. and it was successful! Juvenile and first-year bald eagles are almost all dark, including the bill. They will retain this plumage for almost a year and a half. The bird on the right is a juvenile bird. 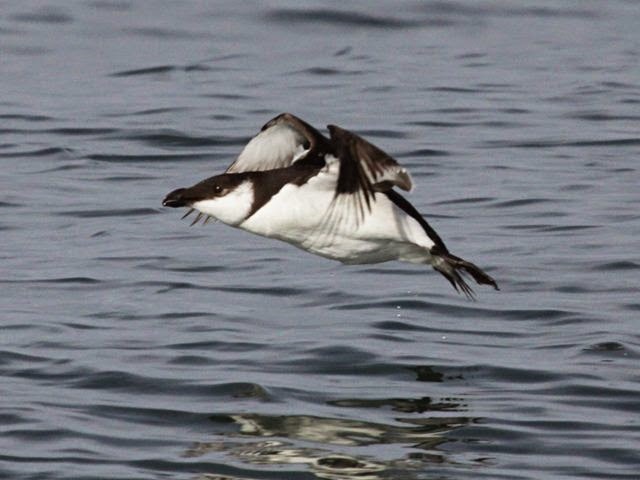 This is a photo of a bird taken at Lake Norman just a couple of weeks ago. Note the head is becoming very pale but is not yet white. The darker smudges behind the eye are more extensive than in the fourth year bird above. The body is getting dark but has some scattered white feathers in the wing pits. The bill is not yet all yellow. This is plumage typical of a three-year old bird. Since sightings of bald eagles in the Mecklenburg County and the surrounding area are increasing, and are likely to increase even more, i thought it might be helpful to remind everyone that eagles can come in a variety of plumages.